Birgit Ulher studied the visual arts and still maintains an active interest and engagement with this area working on drawings, environments and graphic works on polaroids. This is also closely linked with her music in a way notdissimilar to that shown in the Fluxus movement with its affinity with music. Since moving to Hamburg in 1982, she has been involved in free improvisation, dance projects and solo performances and often plays in occasional/ad-hoc groupings with european and american improvisors. 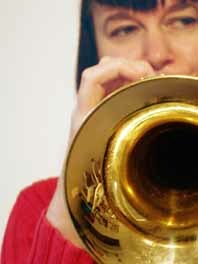 She co-founded a musicians' collective and organised the Real Time Music Meeting, a festival for improvised music.